Michael Lira will face yet another race track for the first time as the ARCA Racing Series presented by Menards heads to Lucas Oil Raceway in Brownsburg, Indiana, for the SCOTT Get Geared Up 200 presented by Federated Car Care. Racing on all these new tracks has made me a much better racer in a short period of time. 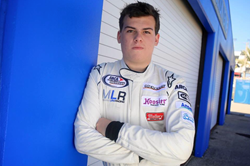 The talented seventeen-year-old stock car racer from Port Orange, Florida, has faced an ARCA schedule stacked with unfamiliar tracks this season, and Lucas Oil Raceway will be no different. Lira has developed some strategies over the course of the season to help him prepare for a race track that he has never been to before. The digital capabilities are a useful tool, but Lira’s best asset is his race team. As a driver for Kimmel Racing, Lira has access to a wealth of knowledge through his crew chief Bill Kimmel and his teammate and mentor Will Kimmel. Bill is an eight-time champion as a crew chief in the ARCA Racing Series and his son Will is an experienced driver running part-time in the NASCAR Nationwide Series this season. Despite facing so many tracks for the first time this season, Lira has already scored two top-10 finishes, notching 9th-place finishes at Toledo Speedway and Mobile International Speedway. The SCOTT Get Geared Up 200 presented by Federated Car Care is scheduled for 9:00 p.m. EDT and will be broadcast live on Fox Sports 1. Follow Michael on Twitter at @LiraRacing and @1MichaelLira, find him on Facebook at /MichaelLiraRacingOfficial and visit http://www.MichaelLiraRacing.com for the latest news and information on Michael Lira.